I tried it out by making some coffee in my backyard (see my video, above). First, I found a small branch that fell from a tree during the last torrential downpour here in LA. It was already dried out from a few days in the sun. I snapped it into 4-inch pieces. I also found some pieces of eucalyptus bark, which were thin and kind of rolled up like cigars. I put a few sticks and some bark into the can and lit it with a match. Once it was burning pretty good, I turned on the fan to the lowest setting (one of four levels) and slowly added more and thicker pieces of wood. The fire made a nice "jet engine" sound. But I got overzealous and stuffed too many pieces in at once and it started belching white smoke. After a minute, the fire inside the can was roaring again, and almost smokeless. I put my coffee maker on top and in a couple of minutes the coffee was finished. It took very little wood to boil the water. According to the literature, a single charge from the attached battery pack will provide about 20 hours of fan life. A camping gas canister runs for about an hour, so a fully charged battery is like taking 20 gas canisters with you, minus the weight and volume (It's up to you to find little sticks to feed it). If you get the BioLite solar panel you can charge it in the field. 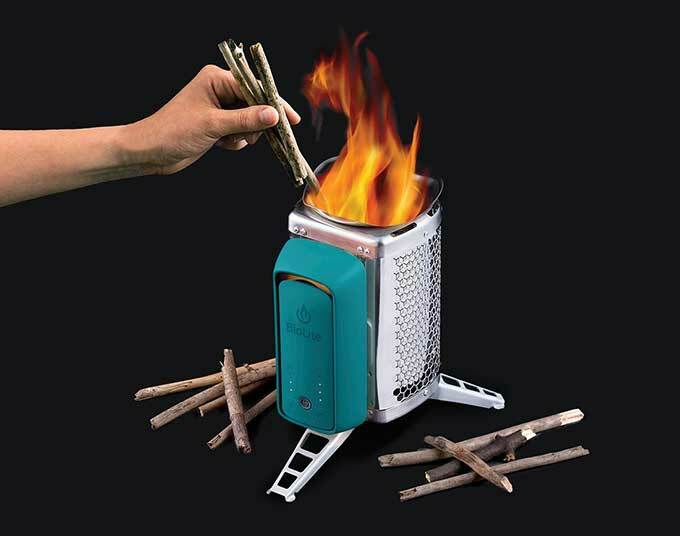 The CookStove weighs 1.6 lbs and has a packed size of 7.75 x 5 in (it comes with a bag and a USB charging cable). This is not a review, since I have not taken it camping or used it more than once. It's just my first impression of taking it out of the box and trying it out. It was fun and very easy to use, and I would definitely take it with me on a camping trip.